…right from the comfort of my own home. Yes, you read that right. I have always loved scented candles. As a former-couldn’t-care-less to a passionate environmentalist that I have become, I now highly favor natural products. As for this particular concern, soy candles. 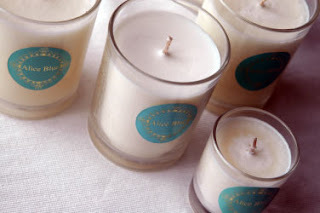 I love most scents from Alice Blue Candle. They last and last, plus it allows me that ultimate bath experience. The great thing about is I don’t have to go to a spa to enjoy the luxury and ambiance. I light the candle 10 minutes before I get into the tub, run the water, pour some lavender bubble bath to match my lavender scented Alice Blue Candle. It can be the most relaxing experience, especially for a work at home mom like me. I don’t get to have this luxury very often even as I juggle things around the house, work and my toddler (who can be a handful by himself) day in and day out, but when I do… it is really something else. I get my supply from G/L Glorietta 3, the stand afront Dockers. A 6 ounce candle costs PhP 395.00 (Approx. $9), which ain’t bad. It can last you 30 hours. 40 hours tops.